Golden Apples: Where do I start? You asked for comments. Here's one! Actually, you look enough like a friend of mine (who unfortunately moved away and I haven't seen her face is two or three years)to be her sister. 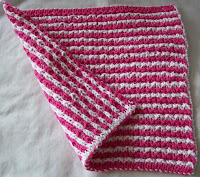 I like to knit, but my hands start aching very fast when I pick up needles, so I don't do it much. I do like crochet, and my hands like it, too. Please enter me in your give-away! Happy Blogiversary! Lovely giveaways too! A suggestion? 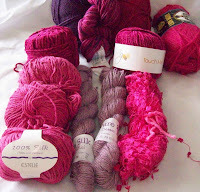 Contact http://wiknit.blogspot.com/ and let her know you're having a giveaway and she'll publish it on her blog if you'd like. Happy blogiversary! Hope you get back in your knitting groove soon. 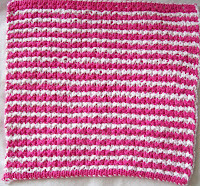 I wish all of your commenters could see how wonderful that double-knitting is, and how easy you make it seem! 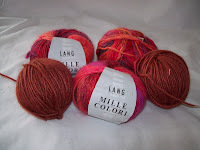 I love the knitting techniques that you post in your blog -- thanks for all the tips, and happy blogiversary! Thanks for setting a good example for bloggers everywhere. Love your blog! And I'm very excited about the giveaway! Darn. I posted about your giveaway, and don't know what blogger did with it. Tucked it in the trash barrel? Anyway, I wanted to say it's really nice of you to have this contest. And say something about your computer desk. I hope that you got it cleared. Our "office" is better because DH got rid of all his obsolete cables and strange little electronic gauges from when he worked. We can walk in here again. 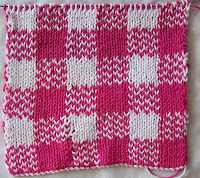 Double knitting with illusion thrown in? Sounds like it should work, but might be a hair ripper. At least at the beginning.